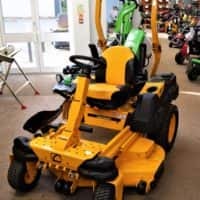 This year shows a new release from Cub Cadet of the Z1 137 a tank of a machine with a 137cm / 54″ cutting deck and featuring zero turn power steering and a very powerful efficient Kohler engine with a twin fuel tank for all day running. This is the machine for the customer who has a field as well as lawn! !We currently have one in our showroom NOW! There are also other models of the machine featuring an even wider cutting deck at 60″. We also stock the new XT series of garden tractors. The Xt2 has a 42″ cutting deck and the tightest turning circle at 17 cm with Cub Cadets Patented tight turn extreme. Another more techy feature of this model is the Cub Connect Bluetooth App which helps to monitor the machine for ease of servicing. We also have a new XT garden tractor coming soon, the Xt3 which has a bigger and more powerful engine. Check out the our product video page for a video demonstration of the features.